Behind every number, there’s a story. Dramatic changes in the demographics of this country are playing out in mainstream America, shifting the cultural landscape and deeply impacting how we look, vote, shop, and live. Launching in fall 2014, AMERICA BY THE NUMBERS is the first national series to examine the new American mainstream-with its growing numbers of Asians, Latinos, and African Americans, people of mixed race, immigrants, women, youth, and members of the LGBTQ community-who are creating a new consensus and increasingly determining the outcomes of political elections. With growing purchasing power and influence over the arts, culture and commerce, these changes affect every aspect of contemporary life across the country. 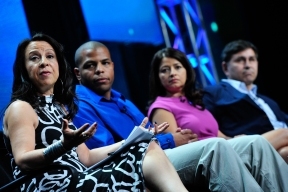 Helmed by award-winning reporter, author, news anchor, and executive producer Maria Hinojosa (NPR’s Latino USA), this compelling documentary series features eight half-hour episodes. Produced by Futuro Media Group and presented by WGBH Boston, AMERICA BY THE NUMBERS premieres in primetime on Thursday, October 2 on WORLD Channel, the 24/7 digital multicast public media channel, and will broadcast on PBS beginning Saturday, October 4, 2014, following PBS NewsHour Weekend (check local listings). The series will also be available across multiple media platforms and supported by a civic engagement campaign and educational curriculum.